Is your practice LGBTQ+ friendly? At the RGPAS Conference in 2016, we were delighted to invite Dr Thom O’Neill (@fakethom) to give a presentation on ‘LGBT Youth in Rural Communities’. It sparked a lot of discussion and consideration about how rural health services could be made more accessible for lesbian, gay, bisexual and transgender young people. Thom presented some startling facts, particularly around the prevalence of mental health problems and accessibility of health services – and introduced many of us to the increasing evidence base about the challenges that LGBTQ+ young people experience when growing up in a rural area. 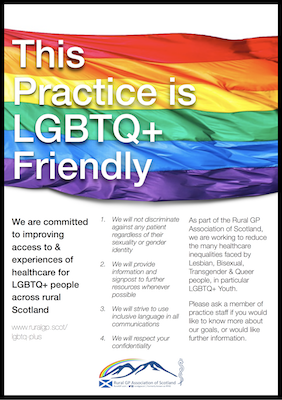 We have put this RGPAS information together to share some of the information from Thom’s talk, and stimulate thought about how we can make rural GP services more accessible to LGBTQ+ young people. Please read through the factsheets, and consider displaying the posters in your surgery and working through the RGPAS Top Tips sections. Many thanks to Thom, Kate and Angus who have worked hard to bring this information to fruition. Many thanks to Dr Thom O’Neill (Paediatric Research Fellow, Edinburgh) who has put in significant effort to make this information available, along with assistance from Dr Angus MacTaggart (Islay GP) and Dr Kate Dawson (Benbecula GP). Thom would like to extend special thanks to Dr Ro Bevan and Dr Jessica Salkind who he works with to improve LGBTQ+ Healthcare for young people across the UK, and who contributed to much of the current work in this area. 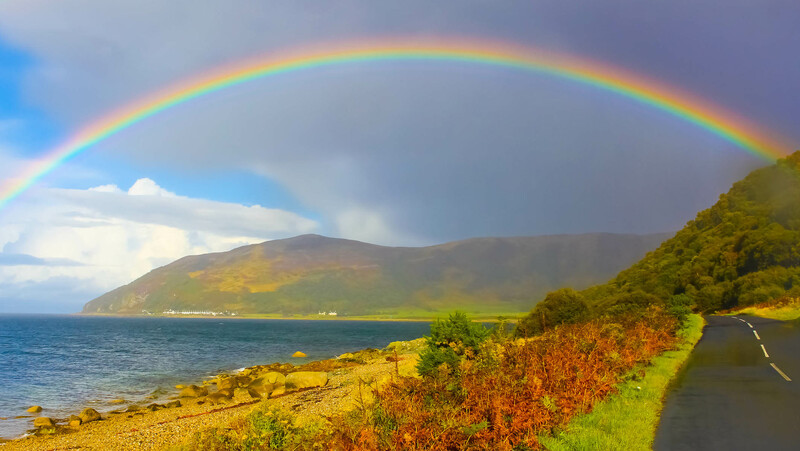 Practice in rural areas has its own set of challenges and oftentimes healthcare is delivered primarily by rural GPs who do a whole range of really amazing things, and one of the things we’re trying to develop is a proper rural programme to support positive change. It’s often the simple things around communication and making a welcoming environment, but there are some specific things that rural GPs could really target. It feels like there is a very positive attitude towards improving practice in this area. What led to these guidelines being developed? A few months after these guidelines were published, Thom and David met up to record this podcast to chat through some of the issues raised by Thom’s talk and the subsequent guidelines. It’s a 50 minute podcast, but we try to cover some of the ‘frequent questions’ around LGBTQ+ health care, and why RGPAS have been keen to develop material in this topic area. including all the links mentioned in our factsheets. to consider in your practice.. 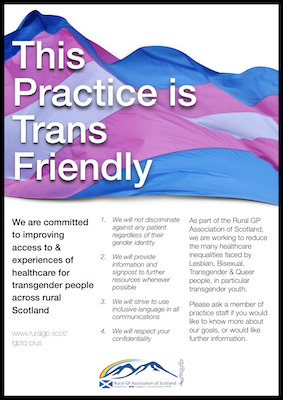 Display a poster in your waiting room stating your practice policy on promoting access to services for LGBTQ+ young people, for example the ones available above. Speak to your local youth group leader and find out how you might be able to engage with youth group work. 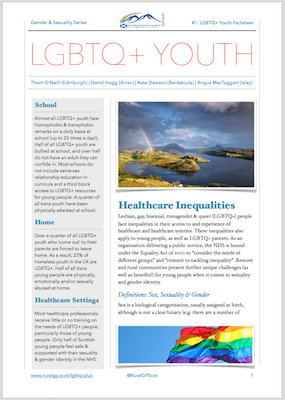 Consider inviting LGBTQ+ young people to your Patient Participation Group, or for a meeting with GP and practice manager. Spend some time at your next practice meeting highlighting the facts in this guide - including definitions within LGBTQ+ - and generate 5 specific actions for your practice to work on. 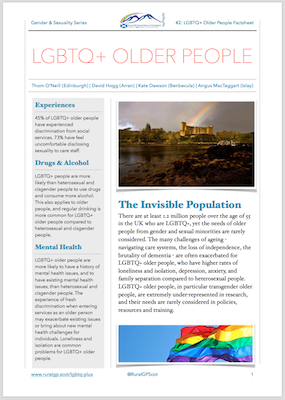 Proof-read (or ask one of your PPG/LGBTQ+ patients to proof-read) your practice website and leaflet to check for inclusive language. 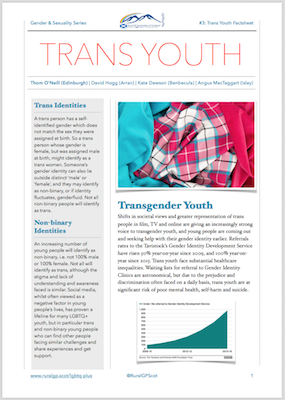 Consider signing your practice up to the LGBT Youth Scotland charter of rights.